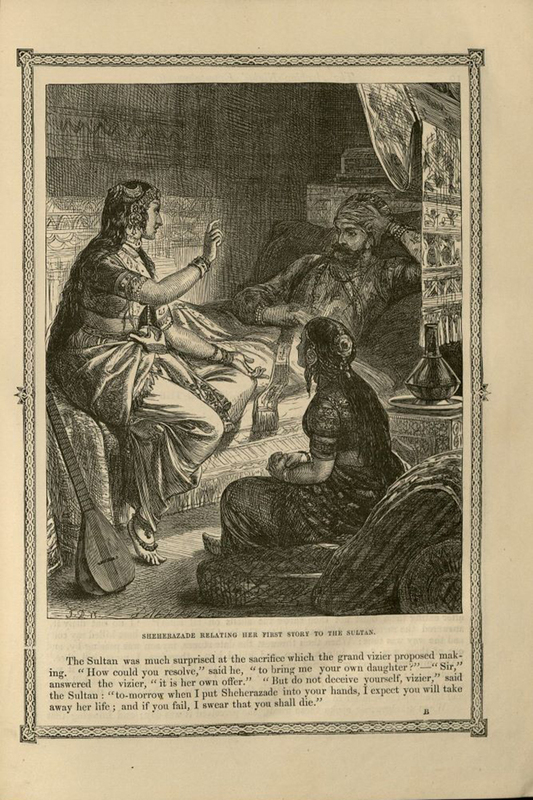 Scheherazade and the Arabian Nights have enchanted readers for centuries. As the story is told, embittered Persian King Shahryar has his wife executed after finding that she has been unfaithful. Marrying a new bride every night, he continues to execute his bride the following morning until he meets Scheherazade, the daughter of his vizier. 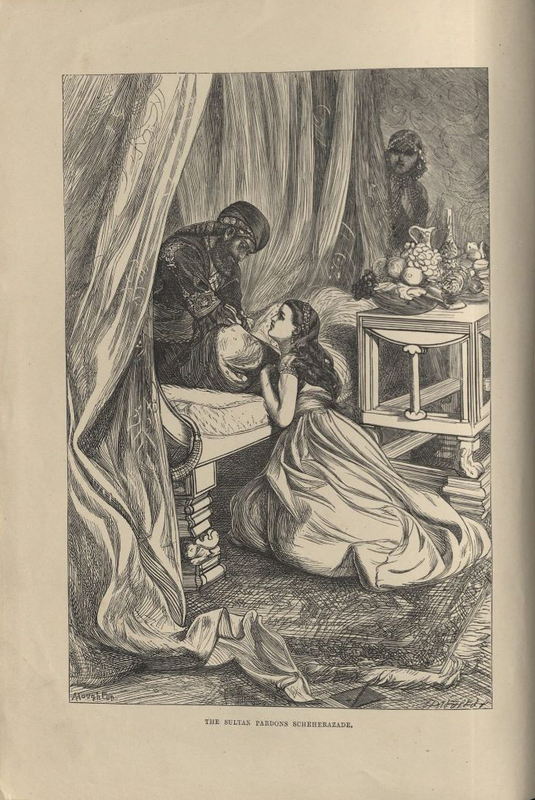 On her wedding night Scheherazade begins to tell her king a tale but does not tell him how the story ends. Because he so wants to hear the end of her tale, he postpones her execution. On the second night she finishes her tale and starts anew. So it goes for 1,001 nights, until King Shahryar falls in love with Scheherazade and makes her his queen . The history of the work is as fascinating as the stories themselves. 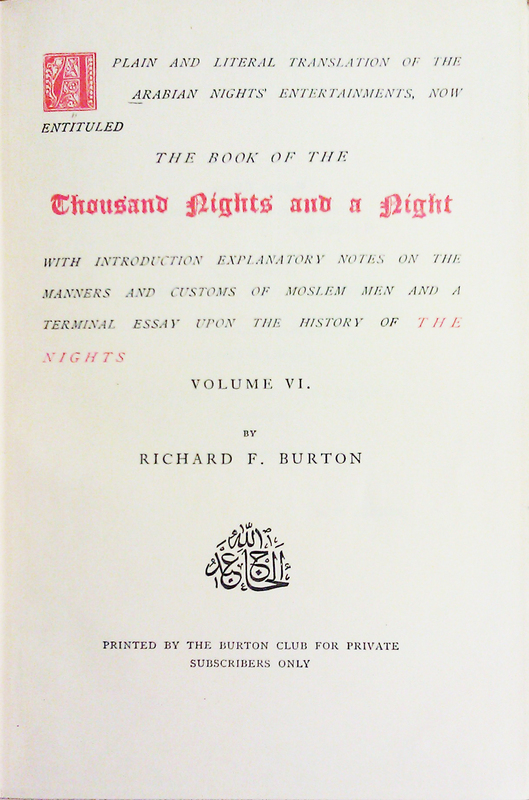 Scholars have concluded that the collection of stories we call Arabian Nights were written by numerous individuals over several hundred years, likely dating to 8th century India and Persia. Dr. Heinz Grotzfeld, professor emeritus of Semitic Philology and Islamic Studies at Westfälische Wilhelms University in Münster, Germany uses a note by a 10th century historian to "infer that complete sets [of the Arabian Nights] were rather an exception and fragmentary copies were far more common … fragmentary manuscripts of the Nights already existed in the ninth century." 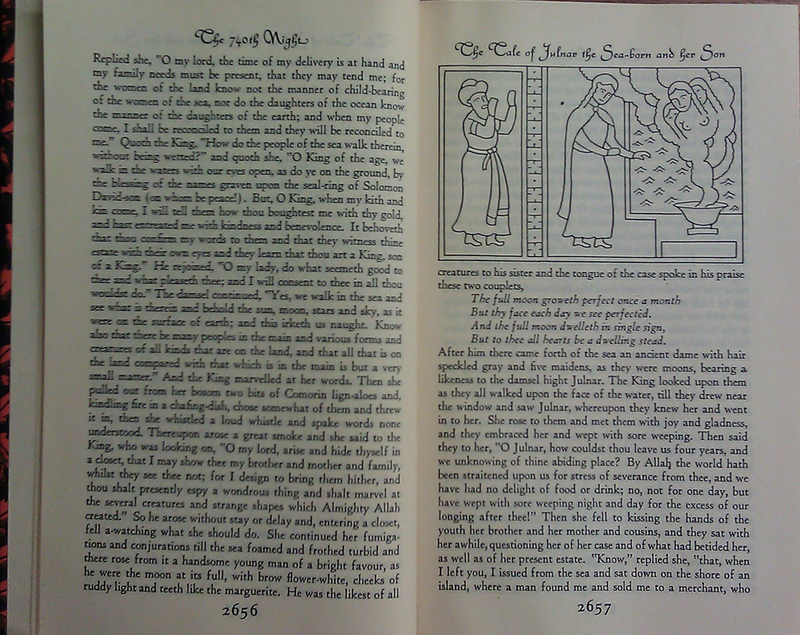 Several of the well-known tales were not part of the "original" Arabic version but were added several centuries later as they were translated into European languages. These include "Aladdin's Wonderful Lamp" and "Ali Baba and the Forty Thieves," both of which have been adapted into feature films. The first European translation was completed very early in the 18th century by Antoine Galland and it is within this tome that these so-called "orphan tales" made their début. Gwendolyn Leick, anthropologist and scholar of the Near Eastern, notes, "Their great variety of themes and styles, narratives and genres, as well as their exotic connotations that fed Orientalist fantasies so profusely, have inspired works of both popular and high culture, but have also occupied the minds of philologists, literary critics, anthropologist and, of course, folklorists." Given this statement, it would naturally follow that scholars have studied (and continue to study) the Arabian Nights from myriad perspectives. The tales have been analyzed from a purely literary perspective, for their form or genre, and have also been analyzed through a cultural and linguistic prism as Arabists study the tales. 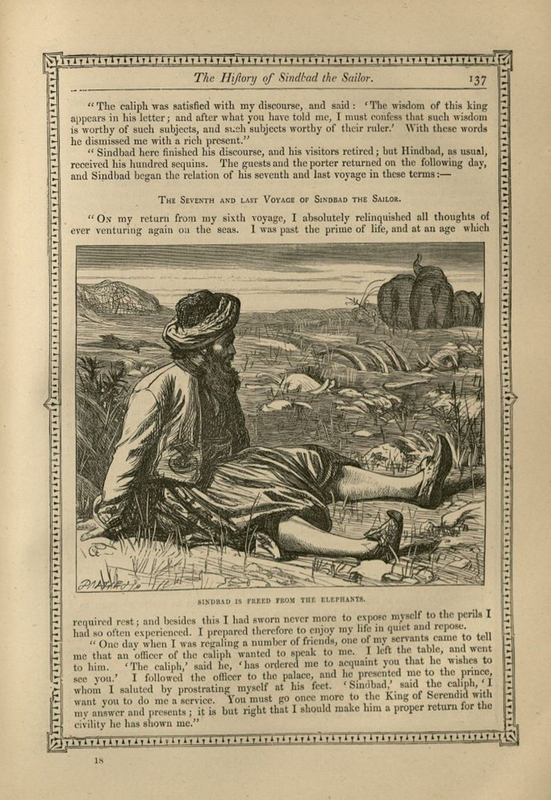 Students and scholars in Gender Studies have studied the Arabian Nights by looking at gendered norms over time and place, as well as recasting characters as contemporary figures. This last perspective has also made its way into modern popular culture. The documentary film Scheherazade Diary (2013) tells the stories of several female inmates of a Beirut prison as they embark upon a 10 months drama therapy workshop and share their stories illustrating difficulties women often face in societies governed by entrenched patriarchy. Similarly Scheherazade Tell Me a Story (2009) is an Egyptian film that tells stories of everyday women as they "struggle against legally sanctioned male entitlement." An additional view of the role that Scheherazade plays in popular culture can be brought into view by a simple search of IMDB. The character filmography has over 30 entries and has been played by the likes of Yvonne DeCarlo, Eartha Kitt, and Catherine Zeta-Jones. 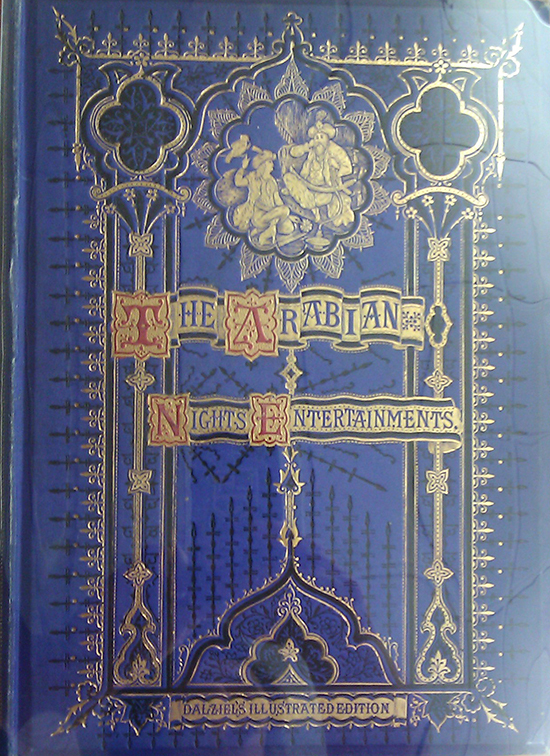 Special Collections and Archives is home to several editions of the Arabian Nights, including: Dalziel's Illustrated Arabian Nights' Entertainments, unknown translation published in the 1880s; A Plain and Literal Translation of the Arabian Nights' Entertainments, unknown date, 10 volumes translated by Sir Richard Burton; The Arabian Nights' Entertainments: or The Thousand and One Nights, 1937 translation by Edward Lane; The Book of the Thousand Nights and a Night, 6 volume, 1934 reprint of the Richard Burton edition; and, The Arabian Nights Entertainments, Containing Sixty-Five Stories Told by Shahrazade, 1955 edition in 2 volumes.